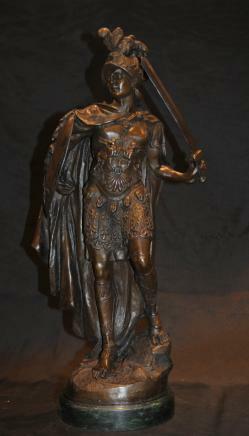 You are viewing a gorgeous French bronze of a Roman Gladiator by the French sculpturist Albert Carrier (1824-1887). I hope the photos do this stunning piece some justice, it’s certainly better in the flesh and would make for a great addition to any home interiors scheme. The quality to the casting is superb. Check out details like the folds in his drape, the plummage and the texture to his dress. 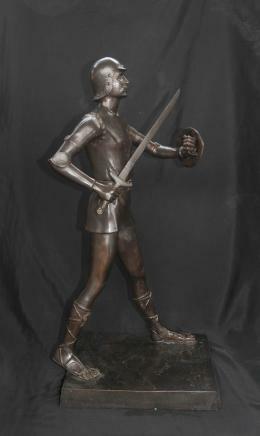 The patina is also wonderful and this sits on a marble base. The artist has really caught the poise and beauty of the soldiers pose with great skill. We bought this from a dealer in Les Halles, Paris whilst on a recent French buying trip and he is offered in very good condition. We will ship to anywhere in the world.